This is a short video showing Papers Citation software automatically formatting the references for a book chapter in real time. Prior to this I chose the citation style (in this case APA) and that’s it. I don’t really understand why academics and students don’t take a little bit of time to learn how to use citation software. This writing involves, to a greater or lesser extent, three simultaneous processes leading up to publication: collecting, processing and writing. That these processes occur simultaneously (with variations in focus depending on the project, and what stage of it I am at) is critical. In other words, writing for me is never: collect then process then write. I attempt to start writing immediately as part of the process of understanding what it is that I am attempting to articulate. This blog post is an effort to share the different tools I use in these (mostly software-oriented) processes. It’s not my usual kind of post, but perhaps it is of interest to those of you who spend time writing. These processes have changed enormously since my time as an undergraduate and masters student in the late 1980s/early 1990s. In those days we dealt with two ways of getting a feel for what was going on in the world of our discipline: periodicals (journal articles) and books. Later we’d use CD-ROMs to get more up to date information. I’ve found developing strategies for handling or processing multiple information streams the most difficult to make as efficient as possible. Indeed, I’m still not there, and these processes involve a certain amount of redundancy (or duplication) that is not ideal. Add to Papers – this is citation software used to add references to writing, and to automatically build reference lists or bibliographies. Points 3, 4 and 5 are the major redundancies in this system. For example, I could add notes to references in Papers, and read PDFs stored in Papers on the iPad. But, although iAnnotate has rather clunky sync services (across Dropbox) I really like its annotation tools and how these notes get synced with the PDFs. Generally speaking, I also tend to avoid database-based systems where possible (what happens if that supplier goes out of business?) but DEVONthink has strong artificial intelligence features for linking diverse ideas that make it worth my while. These applications do, however, cost money (DEVONthink is pricey), and with students I tend to suggest using Evernote as a way of processing information, combined with their University’s citation software (Roehampton University uses Refworks which is painful to use compared with Papers). Any academic or aspiring academic who is not familiar with one form of citation software is making a very big mistake. Markdown is not platform dependent. I can write on a laptop, a tablet or phone, and then these can all sync automatically. For example, I can quickly add an idea to a book chapter I am writing using my phone which will then be available when I go back to editing the book on my computer. Markdown is, quite simply, brilliant to write in. It is simple to learn, flexible, and doesn’t require any special software (just a text editor). 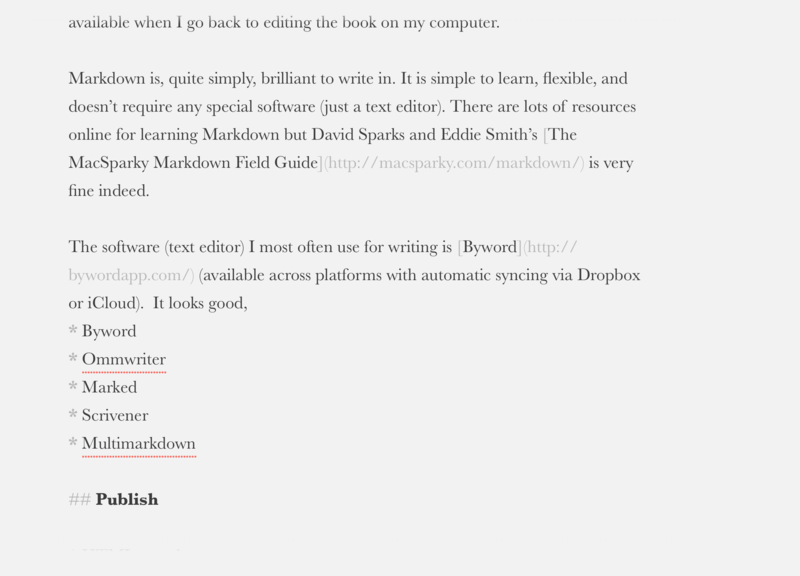 There are lots of resources online for learning Markdown but David Sparks and Eddie Smith’s The MacSparky Markdown Field Guide is very fine indeed. The software (text editor) I most often use for writing is Byword (available across platforms with automatic syncing via Dropbox or iCloud). It looks good – see screenshot – is distraction free, and is all about the writing. Occasionally I use Ommwriter for a bit of variety, and for longer documents I might use a combination of Multimarkdown and Marked. Most recently, I’ve started to incorporate Scrivener for multi-chapter projects. I still do the writing in Byword (Scrivener enables me to sync text files automatically), but Scrivener is very useful for, for example, re-ordering chapters. My understanding of Scrivener though is nascent (at best), and I’m still not convinced it is that useful for how I go about developing and articulating ideas. My writing tends to get published (or shared?) either as HTML for the web or as Word documents. It’s simply unavoidable using MS word in academia. I can’t ignore what my colleagues are most familiar with, and the track-changes function is very useful for working collaboratively (although I’d prefer we used Google Docs for this where possible) or for annotating student work. Markdown was created as an alternative syntax to HTML and I can generate HTML code directly from, for example, Byword. Getting Markdown into MS Word (and having the integrity of headings, lists and paragraphs maintained) is a bit more tricky. I use Pandoc for this. It is pretty much faultless for creating Word .docx files but it does mean using the Terminal in OSX. For creating reference lists, I tend to do this at the very last minute. If I am sending off an article as a Word document I build the reference list (using Papers) after I have converted from Markdown to Word. That’s it – phew. Oh, I should also mention Textexpander. It is a priceless time-saver and probably the software that I use most often without remembering that I am even using it.